So I made my return to Bearcat Arena this weekend. And I couldn’t have picked a better game for it. So I almost didn’t … But I also knew it would be good to get out of my apartment, go to the basketball game and be part of a crowd. So I did. All of the parking lots were full, and the closest parking spot I could find was two blocks away. I arrived inside the arena just as the game was getting underway and took a standing position in one of the wings. Initially, walking along the sidelines by myself to find a seat -- by myself -- seemed too daunting; I figured I'd shyly try hanging in the wing for the duration of the game. I really wished Kates was with me … But I soon got tired of standing. And about eight minutes into the first half, I sucked it up and walked down the sideline to an open spot on the bleachers behind one of the baskets. It’s safe to say the atmosphere at basketball games here has never compared to the raucous game days of our powerhouse football team. Even when the basketball teams have been really good, the atmosphere in the arena has had a dullness to it, which is too bad. I came from a high school where things were just the opposite -- raucous basketball games, but dull football games … Truth be told, after a few minutes of watching the game I was sort of regretting my decision to come and thinking of the other things I could be doing. I’m not the kind of person that likes to spend his Saturday afternoons napping, but even that would have been more exciting. Then my mood started to change. Our home team had been keeping the game close, but I had no clue of the significance until Dr. Bob, our athletic director, whom I’d been sitting next to, leaned over and informed me our opponent had lost just one game this season and was ranked No. 3 in the nation. Our team, on the other hand, came into the game with a 9-10 record; they were unranked. Suddenly, I began watching the game with more interest. And at halftime, our team trailed by just two points. A couple dance performances and a kids relay race later, the second half kicked off. Our boys kept battling and stayed in the game. There were 15 ties, 20 lead changes and no lead larger than six points. In the second half, my heightened interest in the game had me pumping my fists and hollering like an alum should be. With just more than a minute left in the game, one of our guys hit a three-pointer from the corner to give us a one-point lead. But the opponent scored a jumper on the other end to take back the lead with under a minute to play … On our next possession, our guard drove to the basket and drew a foul. He sank both free throws to put us back in front 60-59 with 31 seconds left in the game. The opponent missed a jumper and we got two more free throws to seal the upset with nine seconds left. The other team threw up a couple three-point tries in the waning seconds, but it was our day. When time expired, the crowd erupted. We had won the game 62-59 and knocked off the No. 3 team in the country. I was glad I had come. I returned to my apartment and popped a pizza in the oven for my private party. A few minutes later my laptop was ringing with a Skype call from Kates. My parents also were staying with her and Phoebe for part of the weekend, and despite being separated by hundreds of miles, they were joining my party by the virtues of virtuality. Having taken great joy in watching the Jayhawks clobber Missouri the other night -- not to mention No. 1-ranked Kentucky‘s loss to South Carolina, I was prepped for another good beating last night and pumped for Kansas's return to No. 1 status ... I had been reading about "The Octagon of Doom" all week, which had me only slightly worried. But I had no idea Kansas State had worked itself up to a No. 13 ranking. Plain and simple, I hadn’t been following K-State. It turned out to be my second nail-biter for the day. Eventually, I started feeling bad enough about ruining any of the game's surprises that I was suppressing my emotions -- which wasn't easy. A couple times I managed to pump my fists without making a sound and averted ruining the moment because my parents were looking away from their computer monitor. Or like when I scowled inside as KU turned the ball over in the final minute of regulation, allowing K-State to send the game to overtime. There were other moments -- like when Sherron Collins hit a layup with nine seconds left in overtime to seal the win for the Jayhawks -- that I couldn't contain myself and had to jump out of the camera's view to do a little dance. Ah, the madness. Is it March yet? The world is moving faster. And if you don't adapt, you're going to be lost; you won't survive. That whole adaption thing is coming up a lot in my life lately. But if you ask me, Dawson made his biggest impact with the Cubs. The height of his popularity was in Chicago, and his MVP season in 1987 was arguably the best of his career. Clearly, the the Hall's preference is preserving the history of the Expos. For the sake of myself, my family and all my loved ones, please don't text and drive. Plain and simple. This is worth checking out ... I watched it. Smiled. And then said, "Wow." ... It's a palindrome! Well, I’ll say this: My prediction came true. Brett Favre won’t be winning a Super Bowl with the Minnesota Vikings. At least, this year. When today’s games started, I was still having trouble deciding who I’d root for. All four teams had admirable storylines. In the AFC Championship, you had the New York Jets and their improbable chase to reach the Super Bowl for the first time since Namath called his upset in '69. Or the classy Indianapolis Colts with their star Peyton Manning, arguably my favorite player in the NFL right now. Dan Shaughnessy had a great column about the matchup this morning. Then, in the NFC Championship, you had the New Orleans Saints trying to reignite a deflated city and get to their first-ever Super Bowl. And the Minnesota Vikings, with the ageless and relentless Brett Favre, trying to reach their Minnesota's first Super Bowl since 1976. Ok, so I was kind of rooting for a Colts-Vikings Super Bowl. After all of my Brett bitterness, I had begun warming up to the idea of seeing the ol’ gunslinger taking a team back to the Super Bowl, especially a team that was so starved for a championship. Then the game started. I was charmed by the Saints' heart and annoyed by the Vikings' swagger. Seeing Brett in that ugly purple uniform once more brought all of the bitterness back. As the Vikings started faltering, the emotions of the Packers-Vikings rivalry kicked in and I was slyly rooting for Brett to fail. OK, Vegas: What's the over-under on stories about Archie Manning's Saints days between now and the Super Bowl? Joe Buck wondered if Bourbon St. had ever been so deserted...uh, Katrina? If my husband lives through this game it'll be a miracle! Loves favre picks even more than Viking fumbles!!! This little transition has kept me from watching a whole lot of television lately. I no longer have the DVR to magically record anything that piques my interests. I’ve rarely made it home in time to watch my beloved Nightly News. And then, once I finish my supper, I’ve been too occupied with work projects and Skype-ing with Kates and Phoebe to care much about what’s on the tube. Most nights, I’d rather just listen to music. When the premiere of “American Idol” snuck up on me last week, my reaction was: “eh.” … I tried watching it and got so bored that I turned off the TV after about 40 minutes of it. Thus, I didn't bother watching the next night and missed the "Pants on the Ground" guy who was ALL OVER the radio the next day ... It’s just not the same without Paula, and I still can’t stand Kara. … Maybe I’ll try watching it again when Hollywood Week arrives, but sinking two hours times three nights per week of “Idol” into my life just doesn’t appeal to me right now. I’ve been there, done that -- and now with the news of Simon’s likely exit, I‘m feeling less likely to devote my time to the show. I‘ve virtually forgotten about “Cougar Town” and the new “Scrubs.” Even “The Daily Show” and David Letterman have fallen off my radar (… although, Letterman did get me back this week. More on that in a minute …). The only certainty in my TV-watching routine right now is “Sportscenter” in the morning while I get ready for work -- which is interesting because it was one of the first things to go when I moved to that awful 5 a.m. shift last year. As for my other favorites, I’m finding more and more that I prefer to watch them online whenever I can fit them in. The commercials are short, the picture is clear, you can’t beat it … “Modern Family,” “How I Met Your Mother,” “The Office,” “Big Bang Theory,” and “30 Rock” (in that order) are my must-sees right now. Thursday night’s “Office” had me laughing as hard as I’ve laughed at an “Office” episode in a long, long time -- even though it was clip show. Watching those montages and seeing the funniest moments in the show’s history again was pure joy -- Angela tossing her cat to Oscar during the fire, Jim impersonating Dwight -- and one of my all-time favorite bits -- Jim slamming his car’s brakes and causing Dwight’s head to crash into back of Jim’s seat. I wasn’t complimentary of Conan O’Brien when he took over for Jay Leno in September. I told someone the other night, I used to enjoy watching him on “Late Night,” but I grew up and his material didn’t. It seemed to me he wasn’t growing into his new role at “The Tonight Show,” either, so I stopped watching him after a couple weeks and remained true my old faithful, David Letterman. Leno, I’ve always considered a terrible bore. His monologues come across as glossy, rarely biting and merely good for a couple smiles … Where NBC should have held firm in its decision to pass its late night torch to Conan and given him room to grow, the network copped out and awarded Leno the primetime slot like a consolation prize. I fell into the camp that was just waiting for the whole thing to blow up in NBC’s face. All you needed was to consider the network's recent history. … And yet, I probably kept watching Leno’s show longer than 90 percent of the country, if only for the guests. Boy, did it spur some classic late night television. Check out these recaps on for Tuesday night, Wednesday night and Thursday night. I happily tuned into Letterman most nights and loved his relentless barbs about Leno and NBC … Meanwhile, Leno played it safe and flat as usual. With Leno, I was bored in minutes. Click, TV goes off. And Conan? Conan was on fire. With nothing to lose, his monologues were razor sharp and had me laughing so hard that my side hurt … Between surprise appearances by Ben Stiller, Pee Wee Herman and Steve Carell and some crazy stunts (Example: Supposedly billing NBC $4.8 million to bring “Mine That Bird” on the stage in a mink Snuggie to watch the NFL Network), I found Conan to be as entertaining as he’d ever been -- and I’m not just saying that out of sympathy. Robin Williams shouting “You idiots did the wrong thing!” out Conan’s fake window was priceless. This week’s final shows left such an impression on us that my friend John and I cut short our Friday night on the town and made sure we were back at my place by 10:30 to watch Conan’s final show … Tom Hanks getting the crowd into a Coco chant, the multiple standing ovations and the classic moments montage were chill-worthy (Conan’s cross-country run to open his first show was still a treat to watch). And watching Conan on his guitar for a jam of “Free Bird” with Will Ferrell, ZZ Top guitarist Billy Gibbons and Beck was a sweet, sweet way to end it. "All I ask of you, especially young people ... is one thing. Please don't be cynical. I hate cynicism -- it's my least favorite quality and it doesn't lead anywhere. Nobody in life gets exactly what they thought they were going to get. But if you work really hard and you're kind, amazing things will happen. I'm telling you, amazing things will happen." My friend John had never seen the show. So I explained to him the glorious television he was missing, and this morning he wanted to watch my DVDs of the first season. I giddily obliged. In a search for "Lost" material this week, I stumbled onto this amusing spoof ... Enjoy. Since I got my cable connection established, we've made it a priority to meet for video calls every night, and our time shared via Skype as been more valuable than I'd imagined. Kates and I can make supper together, watch TV together and watch Phoebe play together while sitting in rooms hundreds of miles apart. The figurative journey of our technology has only become more humbling as I've listened to my mother's tales this week about my father's year-long stint at another job when my brother and I were far too young to understand, let alone remember, their struggles. How Dad didn't have long distance phone service, but his employer allowed him to make one early-morning phone call to my mother each week. How Dad had our only vehicle, leaving Mom to seek rides from others or cart us around in our little red wagon. How Dad could only travel home on the weekends, and that was the only time we got to see him -- but how my brother waited to take his first steps while Dad was home to witness it. From the first days we went public with this adventure, people's most common suggestions for survival was Skype ... Some of the best advice I received came during my last days at the News while interviewing a source, who was back home after 10 weeks of being away from her family. No matter what, she told me, make it a priority every night, before going to bed, to say good night to Kates. Often, Kates and I meet around dinner time, after I've arrived home from work --I've enforced a rule on myself to stay at my office no later than 6 p.m. -- and Kates sets her computer at my place on the kitchen table. Phoebe can see me while she's eating, we talk about our days and it feels as though I'm sitting there with them. Some nights, we've stayed online together from dinner time to bed time. On other nights we've only talked for a short time before both of us need to tackle other responsibilities ... Just like me retreating to another room when we're actually living together. Our Skype meetings have become so routine that Phoebe now asks to talk to me ... "Daddy pitchure" and "Daddy 'puter," she says. Along the way, we've established our own little games. One night, I flickered my fingers in front of the camera in a tickling motion and Kates played along by tickling Phoebe, saying "Daddy's tickling you!" When I took my fingers away from the camera, Kates stopped the tickling ... Now it's become a favorite game of Phoebe's that she asks for again and again. She also loves leaning over the laptop to give kisses before Kates takes her to bed. It's not as comforting as actually holding my girls, but it's doing wonders in helping us get by. The sun is bright and starting to descend below the clouds, which look like the floor of an Arctic shelf tonight. Slight ripples and peaceful. … I wish I could take a picture, but I left my camera with Kates, and the only picture-taking device I have on me now is my Blackberry -- which we’re not allowed to use during the flight. I also played with Phoebe a lot. We stacked blocks. We dumped her play food all over the living room floor. We watched her videos -- which, based on their themes, she affectionately calls "Moo" (for cow), "Hose" (or horse) and "Happy Birfday" (you get the idea). ... Best moments of the weekend: When she asked me to lay on the floor -- for no particular reason -- and we just stared at the ceiling -- for no particular reason. And then there was Saturday morning when I started up the "Glee" soundtrack and we started bouncing to "Don't Stop Believin.'" Phoebe couldn't barely stop giggling long enough to shout "Dance!" It was wonderful to be together again as a family, and all the proof you needed was the twinkle in Phoebe‘s eyes … She was delighted by my presence the moment she saw me appear in the airport terminal Friday night. Though I would’ve preferred the classic daughter-runs-to-Daddy-who-sweeps-her-up-in-a-great-hug greeting, Phoebe started jumping around the seating area and shouting “Daddy! Daddy! -- which was pleasant just the same. … As we retrieved my bags and walked to our car, she was positively loopy, hopping and skipping and giggling all the way. It’s easy to say Phoebe’s too young to fully comprehend what’s happening. She still sees me nearly every night on Skype and in pictures around the house. But she seemed more cuddly than usual this weekend. … Throughout the weekend, she hugged my pant leg and uttered that adorable, “Up, peas.” Upon every request, I stopped what I was doing and raised her into my arms. She would hold on for just a little while longer before saying, “Down, peas,” and galloping away to her next desire. But the time passed far too quickly … And though I’m looking forward to returning home -- there’s that ambiguous word again -- I’m not so eager to do it without Kates and Phoebe. My new job is great, I’m surrounded by awesome people -- but it won’t be perfect until I have them to come home to every night. I yearn to be with them. I said to her, “This’ll get easier, right?” Let's hope. … I’m writing this post from somewhere over Missouri, at an altitude of 37,000 feet, on a flight to Milwaukee. In about another hour, I’ll be seeing my beloved Kates for ths first time since we started this separation thing almost two weeks ago. I’ll be seeing Phoebe for the first time since we left her sleeping at the family farm almost three weeks ago … I’ve been trying to imagine all day what it’ll be like to see her face light up at the sight of me walking off that plane. At least, I hope her face will light up -- Kates’ face, too. And yet, I have this strange feeling that I’m leaving something valuable behind. I’ve been in my new role for two weeks now. I’m living two lives … And I’m loving my new one. I wasn’t so sure those first couple days. The emotional havoc of leaving Kates and Phoebe was excruciating. A couple of emotional phone calls during our first couple days apart hardly eased that … And I was feeling so overwhelmed -- with my new responsibilities, the amount of work to do, the change of pace, the reputation of the institution, the pressure to do well -- that I had serious doubts of whether I’d hack it. There were multiple moments of me thinking, What the heck am I doing here!? It also didn’t help that I moved into a winter not seen in the region in decades. I didn’t have cable or Internet access in my apartment. Outside of my office, I couldn’t check e-mail. I couldn’t update my Facebook statuses. I couldn’t come home to watch the nightly news. I couldn’t browse newspapers online. I felt as though I had no connection to the outside world I was used to, and I hated it. I missed "home" terribly. Two days into my job -- I know, just two? you say -- something clicked (Not that I ever had serious doubts about whether it would, but the questions were there). That morning, we had our opening meeting -- 500-some staff inside the arena to listen to presentations and build excitement for the spring session. I was immediately caught by the energy -- the same energy I remembered feeling in my previous life here. I was introduced in front of the staff, listened to the presentations from some of my new colleagues and watched our president engage the crowd with his own excitement and wonderful communication skills. The real boost came when the president encouraged us to wander the arena and greet people. As I strolled from one side of the court to the other, I was boosted by faces I was seeing for the first time in my life and others I was seeing for the first time since I left eight years ago. My landlord, who I’d yet to meet, searched me out to introduce himself and make sure I had settled into my apartment. Others extended hands and warm welcomes that made me feel an immediate sense of belonging. “Man, when I heard you were coming back, I said, ‘Wow! This is awesome!” he said after embracing me in a hug. We caught up briefly on each other’s lives as others continued to greet me while they passed. It felt as though I was home … even though that word has taken on so many meanings the last 10 years that it’s hard for me to say where home is sometimes ... Somewhat shamelessly, when I refer to K-Town, I've been trying to refrain from calling it “home” to give the impression that I'm glad to be in my new home and not missing the old one. Midway through my first week, without realizing it, I got a handle on my new responsibilities and grew more comfortable with my surroundings … By Thursday, I was distributing my first stories and releases. And on Monday, the most nagging hurdle: I conquered uploading releases to our Web site on my own. My new realm is so much calmer and positive than what I've been accustomed to. I don’t have an editor looking over my shoulder and asking every hour for updates on the progress of my latest story. I don't have angry subscribers calling me first thing in the morning and tearing me a apart because I wrote about their daughter getting drunk and crashing her car into a tree. I'm no longer dealing with the burden of feeling as though I'm picking on people for their wrong-doings; instead I'm helping to spread stories about an exciting environment and the accomplishments of those who are a part of it. Breaks are considered refueling, not disturbances … When we had the national championship trophy in our office this week, we took advantage and posed for pictures with it. And today we went out for lunch to celebrate a colleague’s birthday. I have my own office, which I can decorate and personalize … For the last seven years, I’d worked in a 5x5-foot cubicle where posting any personal artifacts was discouraged and all phone conversations could be heard. I have a laptop that allows me to take work with me at night, and I have a Blackberry to enhance my communication and connectivity. Best of all, I'm allowed to listen to music -- a method I rely heavily on to keep me inspired, focused and grounded. I have the honor of working in a towering historical landmark every day. My windows look onto the center of campus and the natural light is so bright I hardly have to turn on the fluorescent lights. I love gazing at the towers on my approach every morning. I love the way the floors creek when I walk across them. I love walking down the grand staircase and seeing the lobby hopping with students. And I love the way the Memorial Bell Tower's signature chimes filter into my office every evening. The only thing I don’t like is the long walk to the restroom. It was like 25 yards down the hall at the News; it’s got to be like 100 yards here. My boss suggested wearing rubber pants. “Whoooooooooooooooooa,” I said to myself. You had to have been living deep in a cave if you didn’t have some suspicions Mark McGwire was juicing when he was smacking all those home runs for the Cardinals. And perhaps even the A’s … Who knows? No one will ever know the whole truth about who was doing what when. My initial reaction to Mark McGwire’s coming-out party is a strong feeling of relief. For years, the larger question has been not whether he did it, but when he would admit it … And any baseball fan had to believe it was going to come soon given the Cardinals' sickening decision to sign him as their hitting coach. I do give McGwire some credit. As I‘ve watched the clips of his admission, I take him to be far more sincere and heartfelt than Alex Rodriguez, Jason Giambi and the other (insert your favorite derogatory nickname here) who suddenly lost the ability to speak the “S” word. And at the same time, sadly, McGwire’s admission has extinguished any lasting bit of glory from that magical “Summer of '98.” Now, it feels so, so wrong and shameful to look back on that season with any of the childlike wonder it conjured. I can’t imagine my McGwire posters or commemorative newspaper pages ever adorning my den walls again. Like a lot of the columnists and talking heads, I’m not buying McGwire’s claim that God-given talent and not steroids helped him hit so many home runs … Sure, hand-eye coordination is a huge part of hitting baseballs. But there’s little doubt steroids also made McGwire healthier and stronger for the duration that he was crushing home runs in the late ’90s. McGwire was riddled with injuries during the early part of that decade and it’s easy to see now how the drugs helped him regain the body capable of putting up the numbers he did. 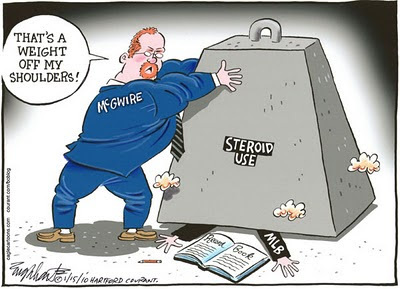 Whether McGwire should be in the Hall of Fame is a whole other issue on which I can't seem to come to a conclusion. The part I think is saddest of all is that numbers like 70, 73 and 762 are here to stay. It’s too hard to know exactly which home runs are tainted for an asterisk to solve anything. No baseball officials -- certainly not Bud Selig -- are racing to strike the numbers from the record books, and most people seem content to shrug them off to “the steroid era.” … It’s hard to imagine any player -- any unequivocally clean player -- ever putting up those kinds of numbers. a So now it's OK to talk about the past? One pleasant surprise -- and a good break from all the hard news I was reading -- was EW's 10 best viral videos of 2009. Every one of these is worth watching ... But I highly recommend "Autotune the News" and "Web Site Story." After watching "David After the Dentist," I also stumbled upon a spoof of the same video featuring Darth Vadar -- which I think is funnier than the original. And, c'mon, I also can't forget the wedding dance and the "12 Days of Christmas" on my own list of the greatest viral videos of the year. Here’s one positive nod for making this lifestyle change: snow days … I’m experiencing my first one today. And yet, the weather is so wretched that my free day will hardly be a joyous occasion -- not to mention the notion that I still have a lot of settling in to do. I also expect to be doing a lot of homework in my apartment anyway. The fact that we have a couple feet of snow on the ground certainly hasn’t helped my morale this week … And in the last couple days, it’s worsened in the thick of wind chills hitting 20 degrees below zero. I mean, we had some really cold days last winter, but I'm pretty sure I've never experienced weather this cold. All of it has forced me to get acclimated to the new job pretty quickly. When the whirlwind of alerting the media to our latest closing settled last night, I began walking back to my office and the secretary called out to me. When I turned around to face her, she paused and added with laughter, "Welcome!" The roads aren’t plowed, the entrances aren’t cleared, the side streets have been reduced to one-way paths. … Yesterday, when I had to drive home to meet the cable guys, I didn’t even bother driving into my parking lot because the driveway was covered in drifts so deep my car might have been swallowed whole. I parked on the road instead. The media here is calling it the worst winter this region has seen since the early 1960s ... And I thought I was getting away from all of this by moving south. I … have … the … power! Finally, today I was granted cable and internet access in my apartment. You don't realize how much you depend on technology until it's gone. … This afternoon Kates and I are sucking WiFi at a Panera restaurant, passing the hours until I have to take her to the airport this evening and we begin our adventure with full-force … We fled here -- to Kansas City suburbia -- this afternoon to enjoy some sense of the civilization we’re accustomed to. There’s a lot -- a lot! -- of questions and doubt circling our heads right now … It’s freezing cold here. And to paraphrase “Wizard of Oz,” we’re definitely not in K-town anymore. We’re in rural America. Over the last week or so, as the media has been producing endless prose and packages about the decade passing by, I’ve been rehashing a lot of the reflective thoughts that went into our decision to make this move -- not to mention all the adventures the last decade took Kates and I on … It blows my mind to think that I’ve ended the decade in the same place where I started it. I’m married to the woman I was with in those early days of the decade, and now we have a beautiful, energetic baby girl. My hair also is a bit greyer now. It also has been interesting to recall all of the different places Kates and I have spent our last four New Year’s Eves. We were in Chicago for 2005 and 2006, we ended 2007 in Toledo, we spent 2008 at home in Wisconsin, and here we are in Missouri to end 2009. That’s four different states. And each of those New Year's Eve days produced their own significant highs and lows, I might add. Next year -- I’m going on a limb here -- Nevada! Seriously, I just want a weekend in Vegas -- just once. If only to experience the Vegas Strip.
" ... There’s a trick to the Graceful Exit. It begins with the vision to recognize when a job, a life stage, a relationship is over - and to let go. It means leaving what’s over without denying its validity or its past importance in our lives. It involves a sense of future, a belief that every exit line is an entry, that we are moving on rather than out ..."
So with that, I’m saying good-bye to 2009 -- you long, strange, twisted year. We’re all surging forward — some with more impetus than others. And now we have 2010 before us, a year that seemed unimaginable until we were right at its border. Our mouths seem destined to stumble. On New Year's Eve, in the moments before the ball drops in Times Square, Ryan Seacrest will smile into the cameras and take on the challenge of summing up the years that will be remembered for a terrorist attack on American soil, a near-depression, the election of the nation's first black president and Tiger Woods's contingent of girlfriends. "Let's count down now as the -- what? -- slips away." Time magazine celebrated the Information Age by putting a funky little mirror on its cover and telling us the 2006 Person of the Year was “you.’’ But did anyone who gazed into it stop to notice how blurry the image was? As 2009 draws to a close, we step unsteadily into the next 10 years. How it unfolds will be far more complex than anything you could say in a 140-character tweet. Then something triggers an image of our silly, adorable little Pheebs. I imitate her "Moo?! On?!" request, and Kates and I sigh, missing her and longing to see and squeeze her again. 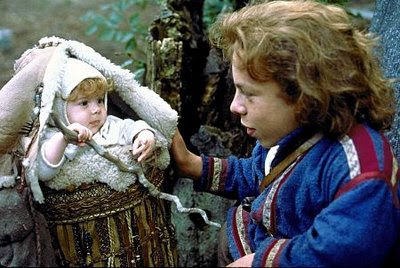 Last night, we watched "Junebug" and -- wait for it -- "Willow." Scratch those thoughts now. I didn't like it at all ... Kates summed it up best when it was over, describing it as a film that leaves you wondering the whole time about what you're missing. It's a film, I thought, that never really seems to have a main theme or conclusion. The story depicts a Chicago art gallery owner, Madeline, who travels to a rural town with her husband, George, to close a deal with a reclusive artist. As a side trip, they go to George's home and settle in for a few days with his family -- his prickly mom, detached father and verbally abusive brother, Johnny. Adams -- while her acting performance was pretty great -- plays Ashley, Johnny's childlike pregnant wife, who is instantly enamored with Madeline's charm and beauty. The film follows the family to a church gathering and Ashley's baby shower, and eventually through a family tragedy as Madeline discovers the idiosyncrasies of George's family ... But none of it pulled me in, and I finished the film feeling more disturbed than appeased. Kates and her brother, on the other hand, grew up loving the movie and she received a DVD copy of it for Christmas last year. So Kates and I made a pact that I would watch "Willow" with her if she agreed to watch "Independence Day," a film I consider a must-see that Kates has not. Maybe it was that I needed to get the bungling darkness of "Junebug" out of my head, but "Willow" turned out to be a welcomed, delightful fantasy film. Not great, but good enough ... It also was interesting to discover Ron Howard directed the film, and George Lucas, who wrote it, had his "Star Wars"-like themes and effects all over the film. Saving the best for last, on Friday night, we watched "The Last Kiss." It was a film I had wanted to see when it was in theaters, but we didn't get around to it, as usual. Like Amy Adams, Zach Braff is another one of those actors who has me wanting to watch anything he does. I so admire his acting chops, his ability to go completely silly on something like "Scrubs," and then reach into emotional depths on "Garden State," not to mention his writing ability. He's one of those people every girl wants to date and every guy wants to hang out with. I also got the soundtrack months ago out of a curiosity for the music on it and a penchant for Mr. Braff's musical tastes. It proved to be a wonderful collection of music with some of my favorite artists -- Fiona Apple, Aimee Mann, Coldplay, Ray LaMontagne, Imogen Heap and Joshua Radin. But the music comes across more powerfully now having seen the film ... I love it when soundtracks do that. Radin's "Star Mile" is one of the most beautiful songs I've ever heard. In the "The Last Kiss," Braff plays Michael, who's been dating his charming girlfriend, Jenna (Jacinda Barrett), for three years, when they discover she's pregnant. But when they attend a friend's wedding, Michael meets free-spirited college girl Kim, who plays with his mind, pulls at his heart and leads him astray from Jenna. It's got an awesome cast. Rachel Bilson is so adorable and captivating as Kim, it's no wonder Michael falls for her. Michael's buddies -- including Casey Affleck's miserable Chris -- also have romantic travails of their own that add other dimensions to the film. And the fact it all takes place in Madison, Wis., isn't bad either. It's a quintessential film about 29 going on 30, about the grips of settling down versus chasing your youth, about keeping what you need or going after what you want. ... I loved it, and I'd love to watch it again -- which I should have seen coming, considering it's also a Paul Haggis film. Yes, "The Last Kiss" has been added to my list. We’ve arrived in The ‘Ville. I’m having to wait until Wednesday to get my cable, though, which means Kates and I are set up in a local coffee shop and sucking free WiFi to check e-mail and catch up on what’s happened in the real world while we’ve been traveling the countrysides. From our family finale at the farm, we left Phoebe with the grandparents and returned to K-Town on Tuesday evening, heated up our leftover Christmas burgers for supper and went on a mad dash of packing. In between all the goodbye lunches and dinner and the holiday celebrations, Kates and I barely had time to pack a dish. That meant we had mere hours to box up as much as possible Tuesday night before we picked up our truck Wednesday morning and began to load it up. We made it until 11 Tuesday night before we could no longer stay awake, and then we slept almost two hours longer than we planned on Wednesday morning. … By 11 a.m. our rental truck was parked in front of the house, and Kates and I were loading furniture. I had ordered a 10-foot truck, but we ended up with a 15-footer at no extra charge because no 10-foot trucks were available on the lot. I wasn’t so sure about getting behind the wheel of a 15-foot truck, but the extra room meant we could move more stuff. It wasn’t easy hauling some of that stuff to the truck (Kates and I did all the moving ourselves), but we cleaned out our guest room and the basement den. The bed, the dresser, couch, chair, desk, stereo -- they all were sent with me. And with the guest room cleaned out, Phoebe now has an upstairs playroom. Grabbing and packing all of the extra stuff was a little more time-consuming. With a stack of old boxes I pulled down from the attic, we were packing, taping and carrying things out as fast as we could -- amid a wet, drizzly snow falling outside. As we gobbled down sandwiches and stood amid the chaos of our kitchen, we decided our goal to hit the road was going to be 2 o’clock. But that came and went. And then it was 3 o’clock. And then it was 4 o’clock when I finally closed the back of the truck and locked it. Flurries flying around us, we locked the doors on the house and boarded our vehicles. Kates led the way, driving my Little Green Machine, and I chugged along behind her in a 15-foot box truck. We stopped around 6 o’clock at a McDonald’s in Beloit and then rolled through Illinois with light snow flying along most of the route. Throughout the week, the biggest story had been the wet weather moving across the country, and Kates and I had fun musing about The Weather Channel playing on every TV we saw between Tuesday night and Friday morning. Seriously, it was on in the restaurants, the gas stations, the hotel. We crossed the mighty Mississippi around 9 on Wednesday night, and I got the chills again. It happens every time I drive across that long bridge, although when I told Kates about it later she admitted the crossing doesn’t have such an impact on her. Perhaps it’s that I’ve traveled the route so many times and that bridge symbolizes the threshold between my multiple lives in Missouri and Wisconsin. But as we approached Iowa City, the snow had grown thicker and the roads were getting treacherous. I lost count of the number of cars we saw in the ditches, and the Interstate had thinned to one lane of pavement. We were fighting with snowplows for control of the road. Kates and I had decided hours earlier that we would stop in Iowa City to fill up on gas and take a break. We had hoped to stop for the night in Des Moines, figuring we’d reach a hotel there around midnight. 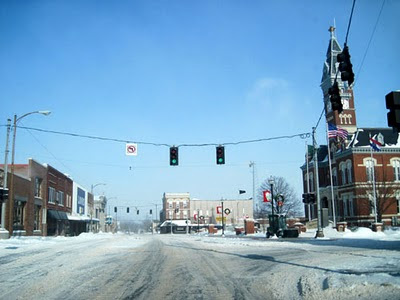 But when we hit Iowa City, I’d had enough of the snowy conditions and I knew Kates was exhausted. When I asked Kates how she felt about calling it a night, she didn’t object and we found a hotel to park ourselves for the night. … When we got settled in out room and switched on the TV, the first channel to come on was The Weather Channel. When we woke up Thursday morning, we were assured we had made the right decision to stop. Now, the sun was shining brightly, the roads were clear and there wasn’t a flurry in sight. And I watched a near-disaster in front of my eyes when a block of snow fell from the top of a semi truck … The semi passed me, and as it did I saw the basketball-sized block balancing perilously on the back edge of the semi’s trailer. Oh by, don’t get behind that truck, I immediately said, envisioning the damage it could cause if it fell on someone’s car. … No sooner had the words left my mouth, a couple cars pulled dangerously close to the rear of that semi. I watched closely and tried to remain a safe distance behind, anticipating the fall. 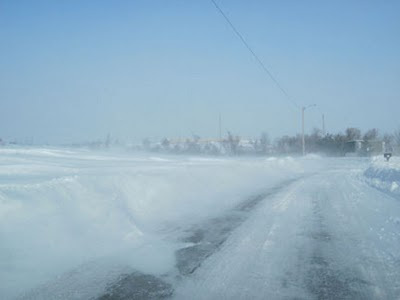 Then, a minute or two after the semi passed me, the block fell … and exploded in a huge cloud of white snow when it hit the concrete. Thankfully, it missed any windshields. Inside Missouri, we turned onto the back roads to make our way through a dozen small towns, tracing the rolling hills and winding roads. The route probably would have amused me a lot more had I not been driving a 15-foot truck. Finally, at around 3 o‘clock, we landed in town. For the record, Fleetwood Mac‘s live version of “Don’t Stop” was playing on my iPod at that moment. Perfect. Luckily, it took a lot less time to unload the truck than it did to pack it. We unloaded the last piece around 5 p.m., just as the sun had fully set. It’s still tough to predict where we’re heading from here, but we’ve arrived.